Episode #141: An Imaginary Summer 2010, Part IV: The Death Of Lois Lane! For this final story in 2010's imaginary summer, the featured imaginary story is THE DEATH OF LOIS LANE. It was published in SUPERMAN 194, February 1967, published on December 15, 1966. The issue contained 32 pages with the cover price of 12 cents. The editor was Mort Weisinger. The art team for the cover and the main story were penciller Curt Swan and inker George Klein. The fourteen page story THE DEATH OF LOIS LANE was written by Otto Binder. This story was not reprinted, according to my research on MIKE'S AMAZING WORLD OF DC COMICS at http://dcindexes.com. Next Episode: REVENGE IS LIFE - DEATH TO SUPERMAN from SUPERMAN 414, which continues the story begun in DC COMICS PRESENTS 87, the subject of episode 138. Episode #140: Showcasing Lois Lane In SHOWCASE #10! 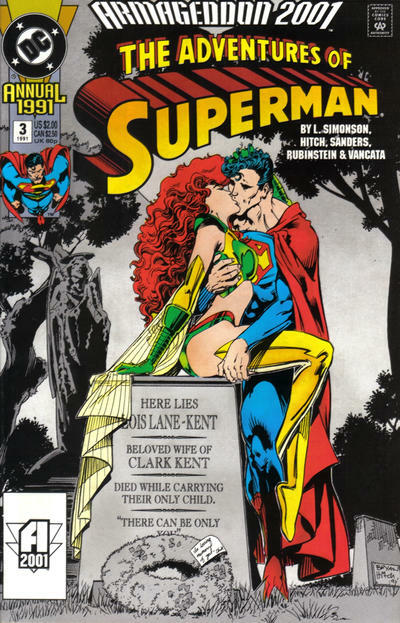 This episode features Lois Lane's second and final appearance in the title SHOWCASE with issue 10. For a look at her first appearance in SHOWCASE, as well as the first issue of her own title, go to Episode 109. SHOWCASE 10, September/October 1957, was published around July 18, 1957. The editor for the Lois Lane issues of SHOWCASE was Mort Weisinger. (The various DC editors took turns editing SHOWCASE every few issues.) The cover, as well as the interior art for all three stories was pencilled by Wayne Boring and inked by Stan Kaye. 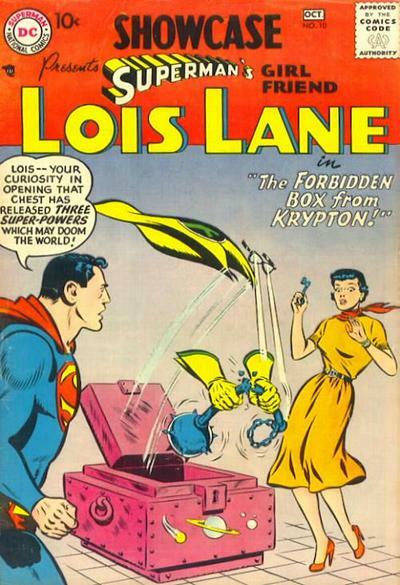 It featured the third story, THE FORBIDDEN BOX FROM KRYPTON. Otto Binder wrote this story as well as the first story of the issue. THE JILTING OF SUPERMAN. Jerry Coleman wrote the second story, THE SIGHTLESS LOIS LANE. All three stories were 8 pages long. At the end of the episode, an e-mail by listener Michael Bradley. Thanks for a great e-mail, and all of your constructive comments and corrections. Next Episode: AN IMAGINARY SUMMER 2010, PART V: THE DEATH OF LOIS LANE! REVISED: Episode #139: An Imaginary Summer 2010, Part III: Superman, Matinee Idol! NOTE: This episode has been revised. After I discovered that only the first 30 seconds of the final edited episode had recorded (how this happened I don't know) I re-recorded the episode and uploaded it. The imaginary stories for this episode come from SUPERMAN 19, November / December 1942, published on September 4, 1942. The editor was Whitney Ellsworth. 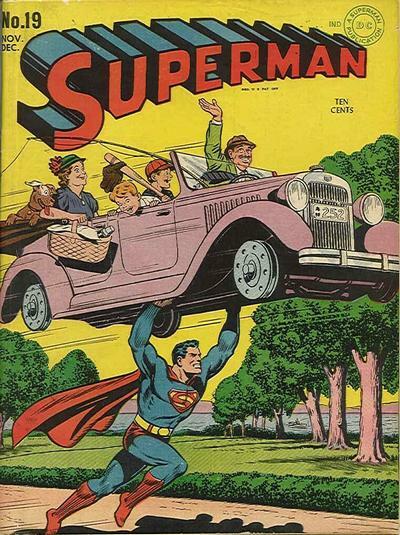 Jack Burnley drew the cover, which portrayed Superman carrying an automobile, without tires on its wheels, with a family aboard, running down the street. That's road service, Superman style. 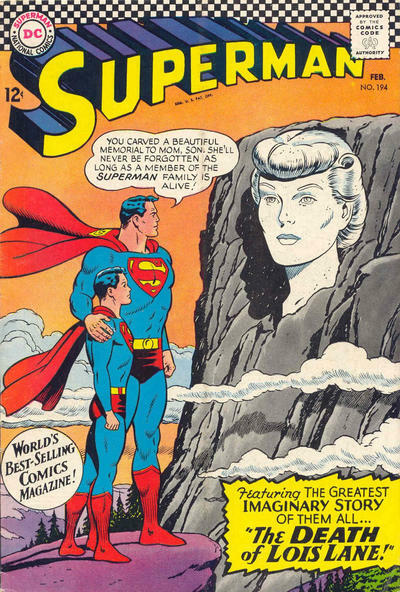 This issue was reprinted in SUPERMAN ARCHIVES, vol. V.
CASE OF THE FUNNY PAPER CRIMES was written by Jerry Siegel, pencilled by John Sikela and inked by Ed Dobrotka. This story was also reprinted in SUPERMAN FROM THE THIRTIES TO THE EIGHTIES. SUPERMAN'S AMAZING ADVENTURE, originally unnamed, but given a title for the Archive, was written by Jerry Siegel and drawn by Leo Nowak. Since I don't have a copy of the SUPERMAN ARCHIVE, the plot for this story came from MIKE'S AMAZING WORLD OF DC COMICS at http://dcindexes.com. SUPERMAN, MATINEE IDOL was written by Jerry Siegel, pencilled by Joe Shuster and inked by John Sikela. This story was also reprinted in SUPERMAN FROM THE THIRTIES TO THE EIGHTIES. Next Episode: SHOWCASING LOIS LANE IN SHOWCASE 10! Episode #138: The Origin Of Superboy Prime: DC Comics Presents #87! DC Comics Presents 87, November 1985! Before Superboy Prime became a villain in INFINITE CRISIS, he was the only superhero of Earth Prime. During the silver age multiverse in DC Comics, Earth Prime was our world, where superheroes were only fictional comic book characters. Superboy Prime first appeared in DC COMICS PRESENTS 87, November 1985, published on August 1, 1985. The editor was Julius Schwartz, and the cover was drawn by Eduardo Baretto. YEAR OF THE COMET was written by Elliot S! Maggin, pencilled by Curt Swan, inked by Al Williamson, lettered by Ed King and colored by Gene D'Angelo. 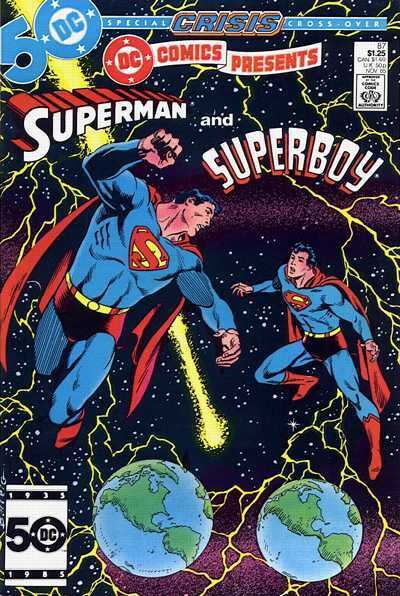 The second story of the issue was THE ORIGIN OF SUPERBOY PRIME, done by the same creative team. There is no reprint information available that I could find. If you would like to read this issue, you can check the back issue bins of your local comic book shop or internet vendor. The stories are also available at the following links: http://superman.nu/tales2/comet/ and http://superman.nu/tales2/superboyprime/. Next Episode: AN IMAGINARY SUMMER 2010, PART III: SUPERMAN, MATINEE IDOL, SUPERMAN 19, 1942! Episode #137: An Imaginary Summer 2010, Part II: Waverider & The Adventures Of Superman Annual #3, 1991! The Adventures Of Superman Annual 3, 1991, cover by Bryan Hitch! This episode continues the Summer 2010 look at more Superman imaginary stories. It follows up Episode 135's look at Waverider and summarizes the rest of his career. The featured story for this episode is THE ADVENTURES OF SUPERMAN ANNUAL 3, 1991. The issue has not been reprinted as far as I can find out. For another perspective of J. Michael Straczynski's SUPERMAN: GROUNDED storyline: http://slaymonstrobot.blogspot.com/2010/07/world-without-superman-part-iii.html. IDW will publish new issues of John Byrne's creator owned series NEXT MEN beginning in December 2010. Dwayne McDuffie will adapt Grant Morrison's and Frank Quitely's mini-series ALL-STAR SUPERMAN for a DC animated DVD movie, scheduled for a Spring 2011 release.